The double clarinet trio is a co-production between the Jazzdor festival, the ensemble Accroche Note and the Europajazz festival in Mans, with funding from the Goethe Institute as well as Impuls neue Musik, a foundation for French/German contemporary music. Six musicians, one instrument…the clarinet. Two groups come together from varied and eclectic backgrounds to create and transform music beyond the boundaries of genre and style. The expression and energy of jazz mix with the virtuosic demands of contemporary classical music, as well as the emotional and spontaneous qualities of folk music. 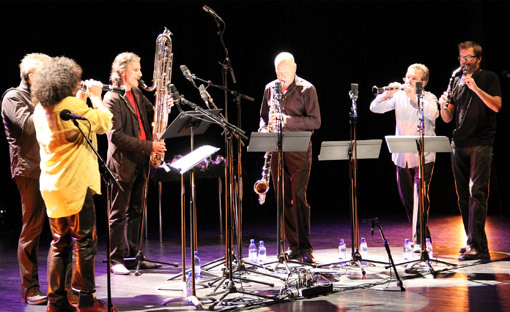 On stage the six intrepid clarinettists voyage with humour and audacity between written and improvised music. With their clarinets of all shapes and sizes, sometimes chattering, sometimes mumbling into silence, they interweave their styles to the beat of modern music. Two clarinet trios, one French, one German… the encounter was inevitable.